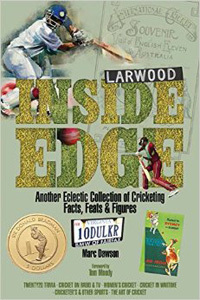 One of Marc Dawson’s previous books, Outside Edge, had a foreword by Geoff Lawson saying, amongst other things, that the author needed to get out a bit more. This time Tom Moody has, like Lawson, also written nice words in his Foreword but it seems that the author has still spent an awful long time indoors. And very glad that, if this has been the case, he has done so. Inside Edge has come up with many bizarre, extraordinary and fascinating snippets of cricketing information. The first page I opened concerned the compound where Osama bin Laden lived and in which he was ultimately killed: unbeknown to youngsters playing cricket outside any stray ball which landed within the compound was not allowed to be retrieved and the errant children received money instead. I knew immediately from this the wealth of information that the book had much to offer. I looked almost forlornly for something which I myself had unearthed to make myself feel better: there wasn’t much but mighty relief when I found something which I recognised. It isn’t so much that Marc has managed to fill twenty chapters and 320 pages in short time with quirky facts and figures but the breadth and extent of his research. Lest it be felt that I have picked up on people generally considered to be less than salubrious, let me get out of the way here that Hitler also gains a mention. There are more joyful subjects and naturally there are many, many fascinating statistics but, for me, Inside Edge’s main feature is the vast range of subjects which Marc Dawson manages to embellish the book with. We know that cricket is a far-ranging, vastly written about sport but Marc’s efforts not only bear that out but show the full extent of cricket’s reach and scope. This review can only mention so much and the reader must simply pick this book up and enjoy it. Further examples of what to expect include politics, crime, the media, combat and writers and painters and much else. Beautifully presented by Pitch Publishing, this book is a bargain at £12.99 and should give much pleasure. The greatest praise that I can pay Marc is that, if you feel yourself to be a number cruncher, this guy has an ability to make you feel quite ashamed about yourself. Well done, Marc, and many of us will, I am sure, look forward to your next venture. And, if he does stay indoors to do so, many of us will be highly pleased. Bring on the next one and, ideally, soon.